In a Press Conference held this evening after the 12 hours Arunachal bandh, the AAPSU President Hawa Bagang said that bandh was successful and thanks all those who have extended support to the cause for the state. Our movement shall continue until the issue is resolved and our fight against granting of citizenship right to chakma-Hajong in Arunachal Pradesh until their deportation from the soil of Arunachal Pradesh, hawa said. he also said that, ” we have allowed the refugees to stay in our state which was done by the central government decades backs but their involvement in criminal activities directly attract to the peaceful atmosphere and they need to be deported anywhere but not in Arunachal Pradesh and blamed the government of India for the mess” . Further hawa said that “If the GOI do not heed to our demand we shall start non cooperation movement against the centre and we shall not to allow functioning all central government establishment in state and warned of not honouring the sentiment of the indigenous tribes of state”. He also questioned the silence of the three MPs of state which include Union Minister for State Kiren Rijuju, MP East Ninong Ering and MP (RS) Mukut Mithi on the issue. Bagang however take the responsibility of damaging of the magistrate vehicle, vehicle of police on duty and ambulance by the protesters and said that the issue itself have drawn sentiment the local people and civil society . General Secretary Tobom Dai extending the gratitude to all those who have extended their full support to the AAPSU bandh all over the state. 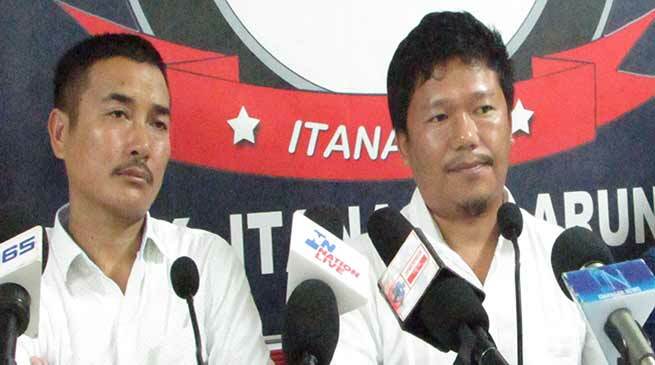 Dai said that AAPSU will once again intensified its movement on certain point which will laid before state and central government as to why one point resolution adopted in the last all party meeting held wherein it was decided that chakma-hajong will never be excepted citizen of this state. On Tibetan Rehabilitation Policy the AAPSU have already submitted memorandum to state government and will not except in present stage. In view of demand for especial assembly session Dai said that we need to talk with the state government before session and will discuss many issues related to the vexed and burning issue confronting the state.